Harry Potter: A Pop-Up Guide to Hogwarts is an exhilarating, interactive guide to the iconic school of witchcraft and wizardry. This book features spectacular pop-up re-creations of key locations inside and outside Hogwarts castle, and it opens flat to form a pop-up map of the castle and its grounds—including the Quidditch pitch, the Forbidden Forest, and beyond. In addition to large pops on each spread, numerous mini-pops will bring to life beloved elements from the Harry Potter films, such as the Marauder's Map and the Flying Ford Anglia. Each pop will include insightful text about Hogwarts as seen in the films, making for a must-have collectible for fans of the wizarding world. Kevin Wilson has exhibited his work globally and worked with clients such as IMAX, Marvel, and Bad Robot. He lives with his wife and two daughters in the south of England. 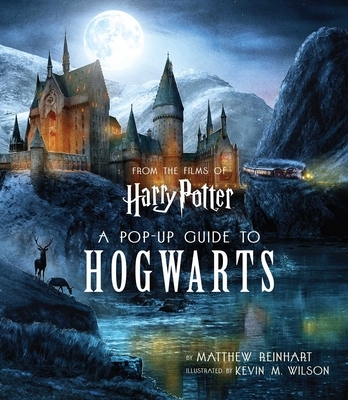 "There are few things better than a pop-up book.’ If this isn’t an aphorism already, it should be, and what better example of why than the new Harry Potter: A Pop-Up Guide to Hogwarts." "A must for any Harry Potter fan." "Every page is gorgeous, but look closer and the exquisite detail becomes even more apparent." "These are exactly what we need to get into a Harry Potter state of mind this Halloween." "This is an incredible pop-up book specimen... It’s a must-have for any collector."